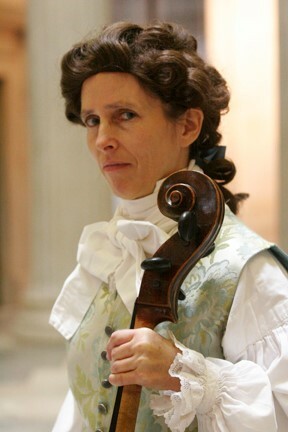 Cellist Christine Gummere played professionally in New York City for 35 years. A versatile musician, she performed in a wide variety of musical styles: 20th century Contemporary, 19th century Romantic and American Swing, all on modern cello; and Classical and Baroque on period cello. In 2001 she left the modern field to concentrate on early music, which encompasses more than 400 years of stylistic evolution. She has narrowed her focus to 240 of those years, from Monteverdi to Mendelssohn. In 2007 she founded a classical orchestra, Sinfonia New York, which specialized in the orchestral music of Haydn. Eventually finding the life of an artist-entrepreneur in New York City too fraught with pressure and angst, Ms. Gummere moved back to the Hudson Valley, where she was born and raised. In 2015 she formed the Hudson River Consort, organizing and performing in concerts that explore the classical and baroque repertoire. Her last concert included a baroque dancer. Her next concert will involve a cello quartet. Ms. Gummere had a horse as a teen-ager and was an avid bare-back rider. She is delighted to partner with horses again through music.